Thank you to everyone who attended our Annual General Meeting for 2018. Our President, David Pavone outlined the activities and successes we achieved in 2017 and the planned activities to come in 2018. We also elected our committee members. 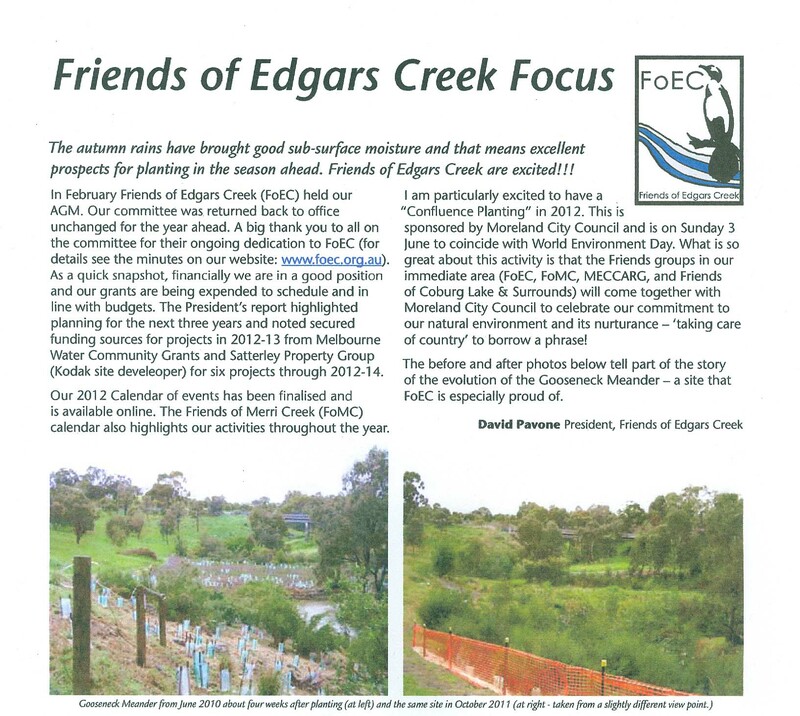 The Friends of Edgars Creek Annual General Meeting minutes for 2015 are available here. The Friends of Edgars Creek Annual General Meeting 2012 was held on Saturday 26 February 2012 at the Hidden Creek Community Centre. The May–July 2012 FoEC focus is also available from the newsletters page. We have two plantings this month. The first is on 3rd June at the Confluence Area and is a combined event with Moreland City Council and our other local Friends of groups to Celebrating World Environment Day. Later, on the 24th June, is grassland planting at the Silurian Cliff site. Hope to see you down at the creek! I hope that 2012 has been good to you all so far and that the year ahead is filled with those things that you want it to be filled with! I am writing to advise that FoEC’s AGM will be held on Sunday the 26th of February. The formal meeting will commence at 1 PM and the venue is the Creek. We will be convening on the east bank of the Creek at the Gooseneck Meander site, just upstream from the (currently out of order) footbridge near Ronald Street. The formal meeting will be followed by a working bee to tackle some of the damage caused by the Christmas storms/flooding. Should the weather be extremely hot or raining we have the Hidden Creek Community Centre booked as a back up plan. All positions on the committee are vacated on an annual basis. Therefore all positions are open for nominations. Please advise me by email in advance of the meeting if you intend to nominate for any of the positions. I can also now formally announce that we were successful with our 2011 Melbourne Water Community Grant Application. This means we are funded through 2012 and into 2013 for more projects that will expand upon our key sites and also see the initiation of works at the Caravan Park site. Thanks to Melbourne Water for their continued support of our group. It is a wonderful endorsement of the work that FoEC has undertaken and is planning for 2012-13 and beyond. Our full year calendar is not yet complete, though I will be in a position to send out a full calendar by the time of the AGM (I have been working on some other projects that I will hopefully be in a position to discuss at the AGM). We will have non-planting events in March and April as we have done in previous years and hope to utilise one of these to present to members on a number of exciting developments for the Creek including the commencement of a formal Master Plan for the Creek between the confluence with the Merri Creek and Edwardes Lake. I hope to see you down on the creek!